‘Prometheus’ had a strange effect on me. As I was watching it, it was as if I was trying to piece together a jigsaw; a jigsaw that I expected to fit into, and expand upon, ‘Alien’. Instead, I found myself taken along with the film and, by the time it finished, I was left with a few pieces that fit onto the Alien jigsaw . . . and some left strewn across the table. But, I think I have it. The jigsaw is complete, but it’s not what I expected. I am left with something beautiful, something unexpected . . . something not quite right. Prometheus shares “strands of Alien’s DNA, so to speak”, or so says Ridley Scott (who directed both films). So what we’re left with is something at times so familiar, and yet so (excuse the pun) alien. Something that Scott can be relied on to bring to all his films, pretty much without fail, are stunning visuals. He has an artist’s eye, and the huge budget gives him the chance to use it to its full effect. The opening sequence is absolutely breath-taking as soaring cameras gracefully survey majestic vistas. In just a couple of minutes the audience has been promised answers, and not just to the questions raised by Alien or ‘Blade Runner’ (which also exists in the same universe), but also to the big questions that have been puzzling mankind for millennia; where do we come from and why are we here? This is cinema on a cosmic scale; dealing with themes of evolution, deities and the significance of man. But, in the end, the contrived answers we are given just lead to more questions, some of which get answered, however many of them don’t. This is ‘2001’ territory. Stanley Kubrick’s sci-fi masterclass manages to cover the cycle of mankind, from its inception right through to the end of life as we know it, and then on to a possible rebirth. The brilliance of 2001 is that it deals with the meaning of life and the universe, but it never lingers long enough to get bogged-down or to suddenly feel the need to justify any contrivances with even bigger contrivances. It gracefully skims across the surface of everything we know – and everything we don’t – leaving the audience to interpret it as they see fit. Prometheus is far less subtle. In a way it’s 2001 for the 21st century blockbuster crowd. Or, arguably, it’s 2001 made by people far less talented than Kubrick . . . or its 2001 made nonsensically by people who think that they are clever, but aren’t. 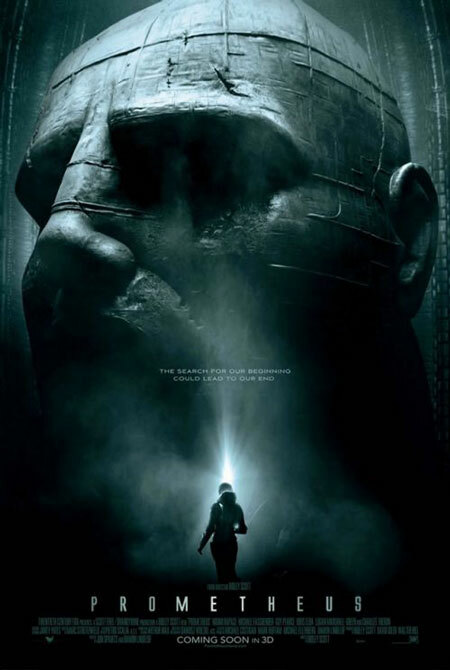 But, whatever Prometheus is or isn’t, it is not a straight-out, lowest-common-denominator popcorn flick. It does not require the audience to leave their brain at the door in order to watch two hours of explosions and car chases, and it should be praised for that. The fact that a film this big is brave enough to explore these huge topics is surely worthy of people’s time and money . . . however successful the answers may or may not be. A thought provoking review jammy. Thanks, I really appreciate the support. You also now have the honour of being my first ever comment! !